Known as the Crawfish Capital of the World, Breaux Bridge is the ideal home for Landry's Seafood, a legendary Gulf Coast restaurant. Landry's menu features fresh fish, succulent steaks and unbelievably sweet desserts – delighting Lafayette area guests for years. With favorites like Crawfish Étouffée and Fresh Catch Pontchartrain, seafood lovers keep returning for more. Situated just off I-10 on Grand Point Highway, Landry's is setting a new standard for excellence in Gulf Coast fine dining. 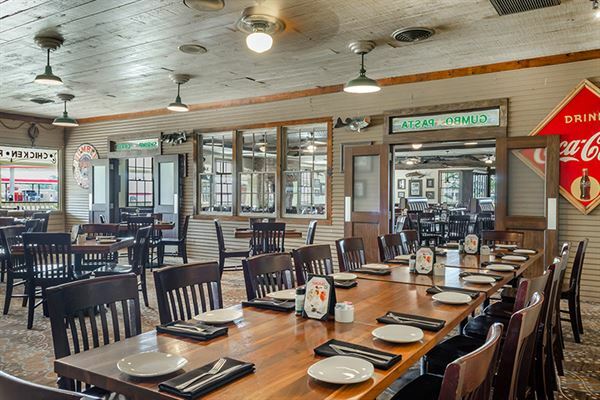 Our private dining room, the Acadiana Room, can accommodate up to 45 guests and our semi-private dining room can accommodate up to 60 guests. We're considered Lafayette, La's premier Bed and Breakfast who specialize in All Inclusive Weddings, Rehearsal Suppers and Elopements. Our stunningly beautiful venue offers inside and outside Wedding Ceremonies and Receiptions and the best thing is it comes fully decorated. The venue can hold up to 120 people comfortably , and we offer 1,800 sq ft of Beautiful Elegant VENUE space to host your event and impress your friends. Image getting married in the HUGE Grand Living Room with 20' coffered ceilings, two walls of glass over looking the Sun room and beautiful Garden backyard and swimming pool. There is plenty of space to display your food in the stunning dining room, plus the over the top space for the cake table in the Wine Room and there's lots of room for your guests to just hang out inside and outside. No extra decorating needed; but you can if you choose! The facility offers tons of parking and the parking is gated; therefore everyone can park safely and free! The Mulberry Tree is available as a Full Service Facility or you can "Do It Yourself" and provide your own decorations and food. Our new 4500 square foot facility is filled with natural light and charm. Our main party space has an antique mantle, several antique buffets and 90 year old cypress windows. Full Service: In keeping with the old fashioned theme of our events, we include fabric table linens, vintage china, and glassware for events. Not only is this style of entertaining charming and nostalgic, it is also consistent with today's efforts of making eco-friendly choices. Many of the place settings, decorative pieces, and linens are vintage or repurposed; all carefully chosen to create your one of a kind party experience. Over the Top & Theme Intensive! Your experience begins with the themed front door decoration and continues throughout the party space with window treatments, artwork and table settings - all that match the party theme. To add a personal touch, the guest of honor's name and age are included in the decor. We also provide frames for you to display photos of the birthday child/bride. We would love to show you our space for your birthday and bridal needs by appointment!